Photo credit Iran HRM: At least 10 political prisoners were executed by the Iranian regime under Hassan Rouhani in 2018. Wednesday, October 10th was the World Day Against the Death Penalty and given the mullahs execute more of their own citizens per capita than any other country on earth, many human rights groups took the opportunity to turn their attention towards Iran. From January to June 2018, the clerical regime has carried out 176 executions. Among them were political prisoners, prisoners detained on drug-re`lated charges, women, and juvenile offenders that committed their crimes under the age of 18. The political climate in Iran is such that anyone voicing their dissent or publicly decrying the Iranian regime’s brutal campaign of violence becomes a target themselves. During the summer of 1988, the Iranian regime executed over 30,000 political prisoners, mainly members of the People’s Mujahedin Organisation of Iran (MEK). Their only crime was holding a political belief in the strength of democracy and a hope for a brighter future for Iran. It isn’t just the executions that concern human rights groups. Reports of prisoners living in appalling conditions are commonplace. Many are subjected to torture. Reports of nails being ripped out, prisoners being suspended by their hands or feet, the denial of medical care, floggings, beatings, limited food and water, and denied use of a shower and toilet have emerged from Iranian prisons. Prisoners have explored avenues of drawing attention to their plight. There have been cases of hunger strikes, where in some cases prisoners have sewn their mouths shut. One prisoner eager to share her story is Atena Daemi, currently imprisoned in Evin prison in Tehran. She is a human rights defender and recently got a letter to friends and family on the outside outlining her ill-treatment. International human rights groups have condemned Iran’s use of the death penalty. Many are calling for an end of executions in Iran. Others are also drawing international attention to Iran’s “grossly unfair” legal system, whereby many prisoners are tortured into signing confessions, are restricted access to their lawyers, and are often found guilty in short show trials lasting mere minutes. Many of Iran’s prisoners do not deserve to be behind bars. But even worse, many of those heading to the gallows do not deserve to have their lives ended so prematurely, particularly the juvenile offenders who were teenagers or children at the time their crimes were committed. A director of Amnesty International commented on the situation. 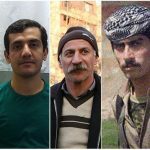 They said, “by carrying out this unlawful execution, Iran is effectively declaring that it wishes to maintain the country’s shameful status as one of the world’s leading executors of those who were children at the time of their crime”. It will rely on pressure from the international community and public outcry from Iranians to save the country’s prisoners from their plight. Only by freeing the country from the yoke of the mullahs can conditions for everyone improve.